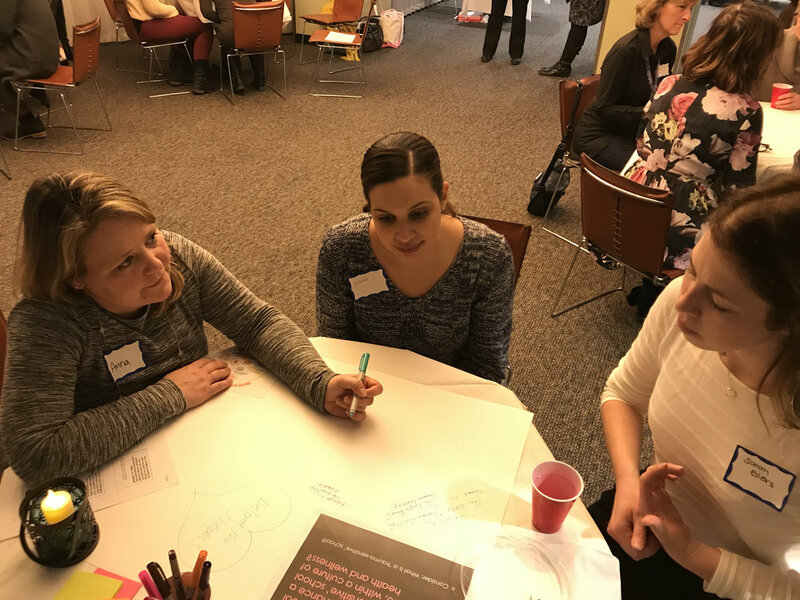 On Thursday, 1/11/18, the Massachusetts School-Based Health Alliance kicked off the new year with its MA SBHA World Cafe, inviting SBHC providers from across the state to share their thoughts, expertise, and collective wisdom regarding Massachusetts SBHCs, as well as recommendations for reinforcing the SBHA mission of '... promoting the health, resiliency, and academic success of children and adolescents, in collaboration with community partners committed to advocating for student well-being through school-based health centers'. The following six questions guided and provoked much collegial conversation and diverse perspectives regarding next steps and 'best practices' - and responses are shared (in no particular order) to continue the conversation and invite others to join in. Many thanks to all who joined in this initial event and candidly shared personal reflections, recommendations, expertise, passionate advocacy, humor, and a sense of community. These responses (and any additional feedback shared with the SBHA) will guide the next steps of the alliance. Looking forward to the next MA SBHA community event! What do you hope membership in the MA SBHC will do for you/your SBHC community? What do you see as some of the most meaningful successes and impacts made possible by the unique work of your SBHC and the specialized expertise of your SBHC practitioners? What role can each SBHC play in supporting a "trauma sensitive" school climate? *No more copies! No more questionnaires! More clinical - Less clerical! *Department of Public Health, Department of Education, and school health community agree upon meeting the standards of care for all children, regardless of insurance or ability to pay, within the school - Integrating behavioral health, school counselors, academic administrators, and health providers - Have a shared vision for SBHC - All sites provide reproductive health services. With changing environment (ACO - health insurance) and need for more mental health, dental, and substance use treatment, how do we change programs and services and meet those need? *Sustainability issues for SBHCs with funding in this new environment - How do we survive? *Protocols and guidelines are dependent on Administration/Principal - How do we work together (school, SBHC, DPH) in a way that there are 'standards of care'?